Like it or not, how you manage your government payments will have a lot to say about your future success. We would rather it would be otherwise but that is a fact of life! 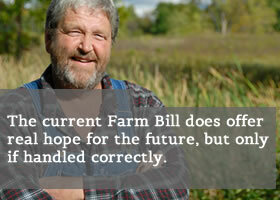 While far from perfect, the current Farm Bill does offer real hope for the future, but only if handled correctly. As our client, you will learn how to take maximum advantage of the game you now find yourself in. That includes help with your planting decisions as well as showing you how to protect your all-important Counter – Cyclical payments. The fact is, the government program will influence many of your day-to-day farming decisions. We are here to help.